The Outreach Pre-College Program invites high school sophomores, juniors and seniors in the New York City area to bring their portfolios as part of the application for its winter 2016 full-scholarship five-week art program. 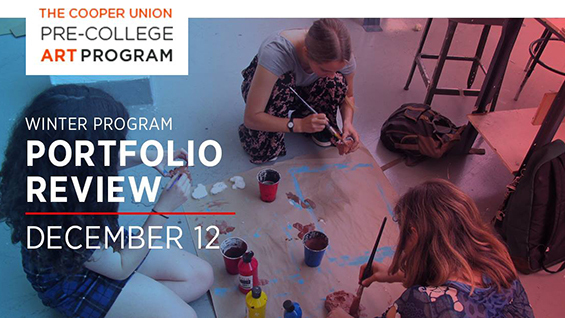 The portfolio review takes place December 12 from 10 a.m. - 2 p.m. at 41 Cooper Square (at East 7th Street and 3rd Avenue) in room 101. You must also fill out an online application. The Outreach Pre-College Program 2016 winter session will offer full scholarships to local high school students to create an artist book and zine project in the Cooper Union Letterpress Studio. Students will work with team instructors Pablo Diaz and Rachel Mendelsohn. Outreach also welcomes back Ava’s Smile for a special “self portrait" project with guest artist Revital Brandes. Your portfolio should include 10-20 original artworks, as well as sketchbooks. Bring samples of your artwork that best represents your abilities, motivation, and interests. Include drawings from observation—those made from looking at an actual object, place or situation. We recommend you bring your actual work not its representation on a display device. Please note that this portfolio review is open only to those students who intend to apply to the Outreach Pre-College Program 2016 winter session and is mandatory for those applicants. See the application instructions for more. The letterpress, graphic design, and digital photography-based art classes will take place Saturdays, January 9 - February 6, 9 a.m. - 5 p.m.